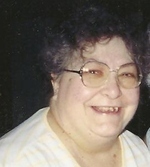 Carrie E. Wagner, age 70 of Ashland, OH., passed away Wednesday, August 01, 2012 at the Good Shepherd Home in Ashland. On November 6, 1941 in Mechanicsburg, OH., Mrs. Wagner was born to Hance and Margaret (McKensie) Ferguson. She had been a resident and homemaker in Ashland Co. most of her life and a few years in Mansfield. Mrs. Wagner had been a member of the Clearcreek Church of Christ. On August 26, 1963, Carrie married Jewel W. Wagner who preceded her in death June 9, 1998. Mrs. Wagner is survived by two daughters: Theresa L. (James) Harris and Gloria A. (James) Saffle all from Ashland; one son, Jamaes H. (Sarah) Wagner of Buckhanna, W.VA.; 8 grandchildren; and 21 great- grandchildren. Besides being preceded in death by her husband, Carrie was also preceded by her parents, one sister, Christane Green on October 16, 2002, and a grandchild.